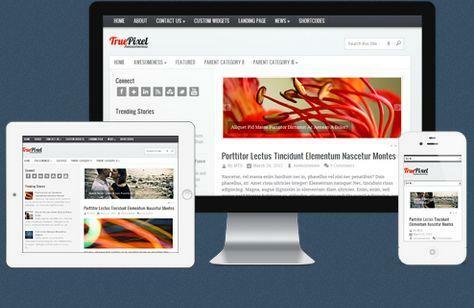 TruePixel is a fully responsive WordPress Theme from MyThemeShop. This Widget ready, clean WordPress theme is a perfect mix of elegance and style. You get an eye catchy layout without compromising on the space for your content. TruePixel is highly customized for speed and usability, comes with tons of options and unlimited color schemes. TurePixel theme is responsive, which means it is great to read on desktops and handheld devices, without a need of extra plugins or software. Typography is important part of website design. You can switch between Top 30 Google fonts from admin option panel without touching the code. TruePixel comes with unlimited color schemes. Give your creativity new dimensions by trying different color schemes. Just one click and each post will show the related posts with thumbnails. TruePixel has inbuilt shortcode generator directly from WYSIWYG editor and has 40 shortcodes to offer. TruePixel comes with 10 powerful and useful custom widgets. Easy to use admin option panel, that allows you to easily customize everything! No need to know PHP, HTML or CSS. Turn one visitor into multiple pageviews, with the included related posts widget that entices visitors to view more posts. Outsmart and outrank your competition, with the built-in search optimization that will help you rise to the top of the search engines. Be prepared for the future of the web, with HTML5 and CSS3 technology that makes your theme faster, more flexible and future-proof. Need help with installation or configuration? Our premium support team is highly trained and ready to help you. Watch your earnings rise, with our Adsense optimization that is designed to maximize your CTR and CPCs . Share the post "Themes TruePixel"